St. Joseph, MI home care team explores how to recognize mental illness in senior loved ones. 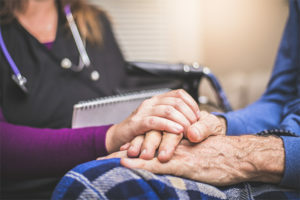 Regrettably, as few as 7 percent of older adults age 65 and over who probably have some kind of mental illness are actually receiving treatment, based on a report by the American Journal of Geriatric Psychiatry. Dr. Susan W. Lehmann, clinical director of the division of geriatric psychiatry and neuropsychiatry and director of the Geriatric Psychiatry Day Hospital at the Johns Hopkins University School of Medicine clarifies, “Indeed, compared with younger adults and middle-aged adults, adults over age 65 were much less likely to be asked by their primary care physician if they felt tense or anxious and were much less likely to be referred by their primary care physician for mental health specialty care.” Fortunately, you will find effective treatment options for mental illness in older adults. Step one is to talk to the senior’s primary care doctor, who is able to recommend the best medication and/or therapeutic choices to consider. Our St. Joseph, MI home care team will also help by escorting the senior to medical appointments and counseling visits, picking up prescription medications and providing reminders, and serving as a caring companion to share in conversations and also to pick up on any changes that may indicate the necessity for further assistance. Give our St. Joseph, MI home care team a call at 269-849-9252 to find out more.